The news for Arkansas fans just got worse. Not only did they lose to Louisiana Monroe Saturday night in overtime, but they may have also lost their starting quarterback this weekend for the Bama game. It is being reported by several news organizations that quarterback Tyler Wilson may miss the Bama game because of a concussion. The quarterback stayed over night in Little Rock for his head injury and is reportedly day-to-day. Wilson, who played in the first half of the LA Monroe game, did not come back in the second half which was a HUGE reason why the Warhawks were able to defeat the Hogs. 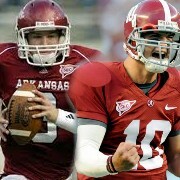 Now, Arkansas may have play freshman quarterback Brandon Allen this week against the Tide defense. Although Allen threw a touchdown pass Saturday night, he was unable to get the Arkansas offense going in the second half. Good luck trying to get it going now if Wilson doesn't play. See the game winning TD of Louisiana Monroe over Arkansas last week..